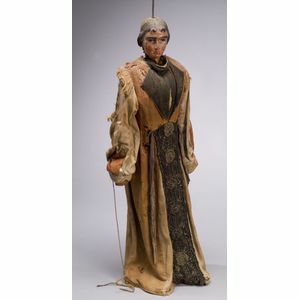 Memento Mori Marionette, probably 18th century, the carved and painted head with two faces, depicting a young man on one side, and on the other a skull, with stuffed torso, fabric limbs with carved hands, the left modeled as a clenched fist with steel articulation ring and aperture (originally for a sword, or scythe ? 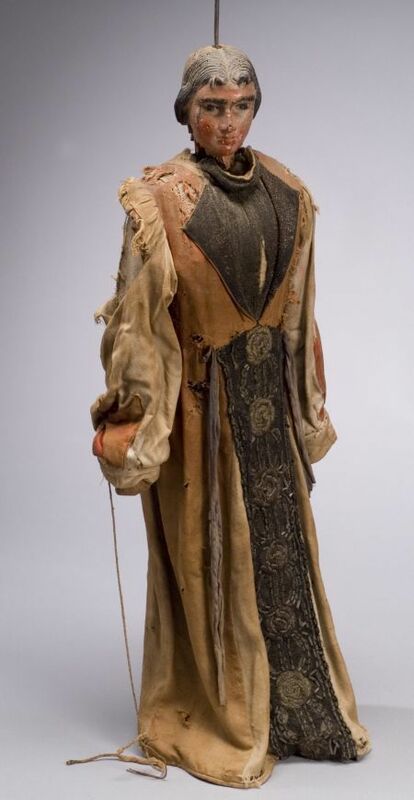 ), the legs with tenon joints at the knees, remains of paint on the lower legs and carved feet with sandal straps, dressed in faded Ecclesiastical robe with white panels, metal-thread vest and beaded panel on the skirt, the reverse in white shroud with red panels, the head with steel suspension rod for rotating between the two, ht. of figure 31 in. Provenance: Discovered in the attic of a farmhouse in Northford, Connecticut.